Help to Save the Zoo Trip is an interactive and humorous picture book full of fun activities for kids aged 3 to 8 that’s guaranteed to make you grin from ear to ear. What is Help to Save the Zoo Trip about? This book is about a School Outing to the Zoo. However, the animals escaped last night. Now the kids need help to find the animals and get them back where they belong. · Can you help the animals to find their little ones? · Can you find which droppings were left by each animal? · Can you tell what each animal likes to eat? · Can you find the items the animals stole from the gift shop? Double-click on the pictures to see the pop-ups. 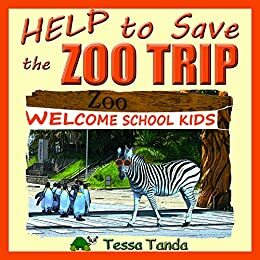 ‘Help to save the Zoo Trip’ is a humorous picture book about a typical school outing. However, last night the gates in the zoo were not closed properly. Now the animals are all over the place. The kids and animals need you! Help find the animals such as an elephant, a giraffe, a panda, a polar bear, a koala, a monkey, a crocodile, a kangaroo, and a camel and get them back where they belong. *Can you help the animals to find their little ones? *Can you find which droppings were left by each animal? *Can you tell what each animal likes to eat? *Can you find all the items taken from the souvenir shop? ˃˃˃ Fun for the entire family! Read this book at bedtime or Saturday/Sunday mornings: To end or start the day with a smile. It is a book to enjoy together; it is fun for the younger ones (preschool) to look at the pictures and look for Tanda and the souvenirs, the older ones (ages 6-8) can probably answer the questions without the help of mom or dad. Which animal is your favorite? You’ll find the most popular Zoo Animals in this book, is your favorite among them? Book 1 is called ‘Help to Save Sports Day’. It is about mix-ups at Baseball, Basketball, American Football, Tennis, Ice Hockey and Soccer. Book 3 is called ‘Help to Save Career Day’. It is about mix-ups related to all kind of jobs such as Astronaut, Pilot, Police Officer, Teacher, Writer, Musician, Actor, Doctor, and Firefighter. You can connect with the author on Twitter: @tessatanda or via her website tessatanda.com. Please leave a comment below, I would love to know what you think of this book. This entry was posted in Children's Corner, Uncategorized and tagged Help to Save the Zoo Trip, Help to Save the Zoo Trip by Tessa Tanda, Tessa Tanda, This book will make you grin from ear to ear, Useless Warrior Princess. Bookmark the permalink.